To craft informed sermons, pastors scour commentaries that often deal more with minutia than the main point. Or they turn to devotional commentaries, which may contain exegetical weaknesses. The Teach the Text Commentary Series bridges this gap by utilizing the best of biblical scholarship and providing the information a pastor needs to communicate the text effectively. The carefully selected preaching units and focused commentary allow pastors to quickly grasp the big idea and key themes of each passage of Scripture. Each unit of the commentary includes the big idea and key themes of the passage and sections dedicated to understanding, teaching, and illustrating the text. 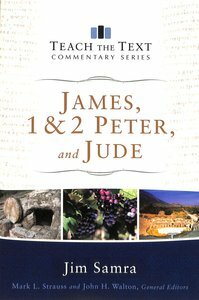 The newest New Testament release in this innovative commentary series is Jim Samra's treatment of James, 1 & 2 Peter, and Jude. About "James, 1 & 2 Peter, and Jude (Teach The Text Commentary Series)"
Jim Samra is a servant of Jesus Christ currently ministering as the senior pastor of Calvary Church in Grand Rapids, MI, a job which forces him to depend on God daily. He holds degrees from the University of Michigan, Dallas Theological Seminary, and the University of Oxford, and is also the author of the book Being Conformed to Christ in Community. Jim and his wife, Lisa, have four very young children and are happy but tired most of the time.